Regular power flushing is a necessary step in keeping your central heating system running in peak condition. Power flushing removes sludge, which includes rust and other problematic things. If this debris is left in your central heating system, the overall efficiency of your unit will be severely compromised and your system – from the boiler to the pipes – could potentially even break down. If your central heating system is not in the best of condition, power flushing is the most efficient way to deal with the problem. 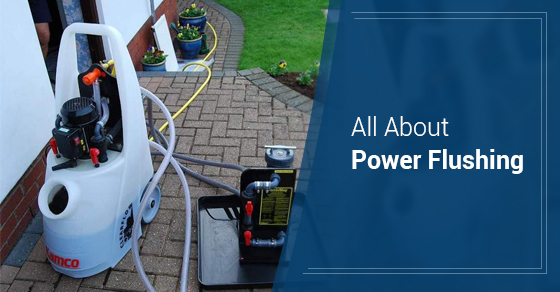 The process of power flushing involves the use of chemicals and high water pressure. Depending on the amount of sludge in your system, a half day is generally required in order to remove it (if your system is small) or a full day if you have a large system. The first step is connecting the necessary equipment to your central heating. Note that this process will not involve taking off any radiators. Power flush cleaner will then be added to loosen sludge. It is typically added hours and days before the rest of the procedure. Water will then be flushed through each radiator. This is followed by the further flushing of the radiators, boilers and pipes until they produce clean water along with a neutral pH. This will be followed by Inhibitor fluid, the last step of the process, which will work to prevent any further debris from collecting in the system. Can I Power Flush Myself? It will be well worth your time to have a professional complete the task as they will not only have the best quality machinery but will also know which type of machine to complete the job, depending on the size of your particular system. A professional will achieve the best possible results. If you are in need of a power flush, contact our team of plumbing experts at Brothers Plumbing today. We have over 50 years in the business and a superior track record in the industry. We offer competitive rates, upfront quotes and 7-7-7 service.